Most women who develop endometrial cancer are postmenopausal and over 40 % are over the age of 65. As the population ages, the burden of endometrial cancer is likely to increase. Age remains a poor prognostic factor with older women often presenting with higher stage and adverse pathology features with subsequent higher recurrence risk and worse survival. 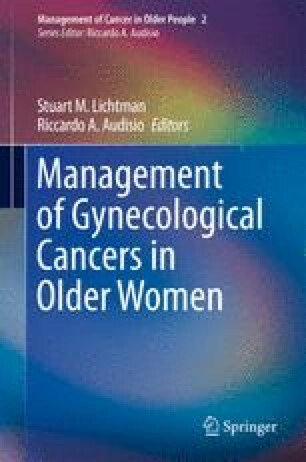 Though there is limited data on direct efficacy and toxicity for elderly patients, many significant trials in gynecologic oncology have naturally included older women. Treatment options for elderly women in the advanced and recurrent setting include combination chemotherapy, hormonal therapy, radiation therapy and combined treatment modalities. Balancing the comorbid conditions in the elderly population with treatment tolerance remain challenging for the treating oncologist. Howlader N, Noone AM, Krapcho M, et al., editors. SEER cancer statistics review, 1975–2008, Bethesda: National Cancer Institute. http://seer.cancer.gov/csr/1975_2008/, based on November 2010 SEER data submission, posted to the SEER web site, 2011. Martin-Hirsch PPL, Jarvis GG, Kitchener HC, Lilford R. Progestagens for endometrial cancer. Cochrane Database Syst Rev. 1999; Issue 3. Art. No. : CD001040. DOI: 10.1002/14651858.CD001040. Kokka F, Brockbank E, Oram D, et al. Hormonal therapy in advanced or recurrent endometrial cancer (review). Cochrane Database Syst Rev. 2010;12:Art. No. : CD007926. DOI: 10.1002/14651858.CD007926.pub2.